Deb's Cup of Tea: He won, again. "No, I'm sorry. He's out in the field. May I take a message?" "This is Belinda at Chipotle and we drew his card for our free burritos. We were hoping he could do it today but if he's not in, can we do it tomorrow?" It was all I could do not to laugh in her ear. See, this is a running joke within the office. 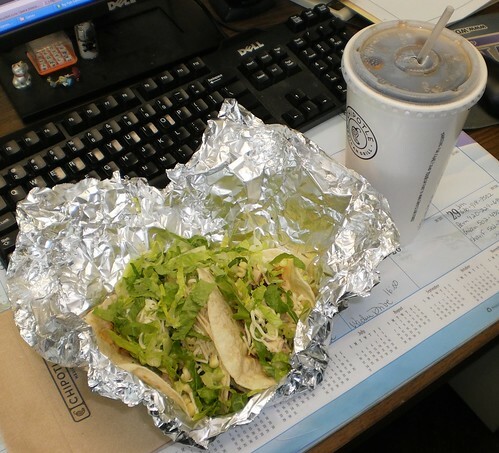 Roughly once every 10 days, Mike goes over to Chipotle, which is a block from the office, and gets lunch. Toss your business card in their fish bowl and they draw a card for a free lunch. You get at least 6 burritos free. Mike's luck is such that we can count on free Chipotle lunch about every 3 months. They know him over there. Three soft chicken tacos with mild corn relish and lots of lettuce and cheese. Sometimes I get a soda. Sometimes I don't. They don't have Dr Pepper so I have to settle for Coke. The new guy, Gene, quipped that this is an awesome place to work. He's had free lunch once each week since he started.